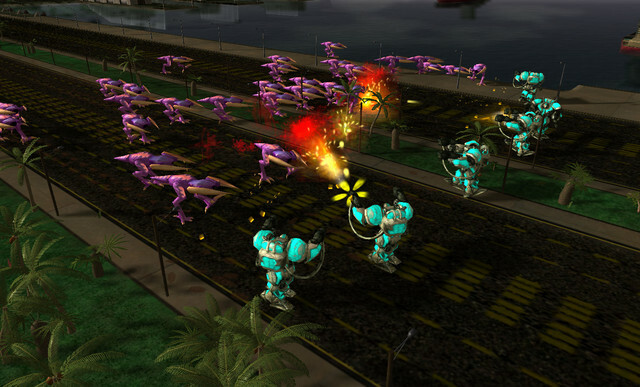 Chicken Defense is a gamemode where the players and their robot armies attempt to fend off increasingly strong waves of chickens spawning from burrows scattered across the map. When the time comes, they must confront and defeat the chicken queen in order to win the game. The Chickens, a ravenous semi-sapient species of organics that devour all in their path... Their origins are uncertain, but it is already clear that these monstrosities are not the product of natural evolution. Nor would any machine intelligence be utterly insane enough to create such an abomination. Whatever their roots, though, there are more important questions: Do these chicken hives have any ulterior goals? All difficulties also come in Eggs variants, where there are no mexes and chickens drop twice as many eggs (more on that later). You can set the game to Eggs mode in the Adv Options menu. Over the course of the game, you will be attacked by wave after wave of chickens. 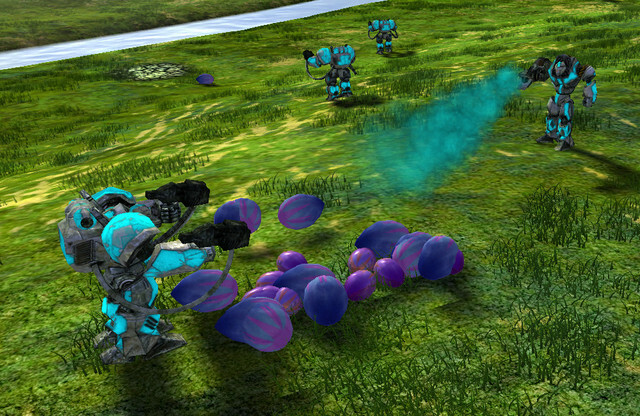 Two types of chickens will usually appear in each wave, although the hive may simply send a single type. Initially, you will only be attacked by basic chickens, which are fairly easy to defeat. 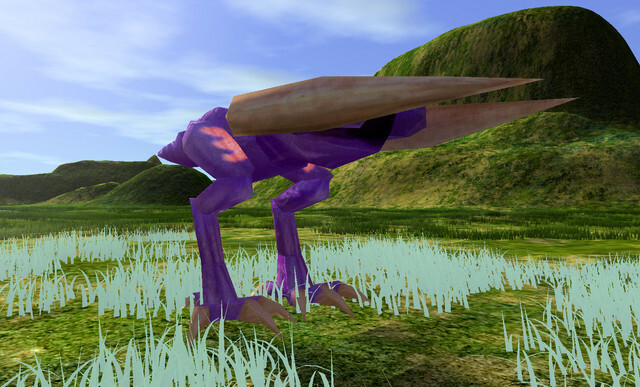 As the game progresses, the hive will send increasingly powerful forms, often with unique abilities, to defeat you. Chickens originate from burrows, which spawn continuously within a certain distance from player units. Each burrow sends its chickens at a random unit belonging to the closest human player. Burrows spawn more quickly the more players there are and the fewer burrows already alive. Burrows can also spawn defensive Chicken Tubes to protect themselves. The Hive Anger meter increases continuously over the course of the game. When it reaches 100%, burrows stop spawning and the Queen appears. The players must work together to kill her before she flattens everything in her path. Chickens drop eggs when killed, which can be reclaimed for metal. Burrows also drop multiple eggs when killed. Chickens will gradually upgrade to more advanced forms with the game timer. If the players are not aggressive, the chickens will "tech up" faster. Conversely, killing a burrow will cause the tech meter to regress by a large amount. This means that you can literally bomb the chickens back into the Stone Age (or the Triassic). On the flip side, however, killing too many burrows will also cause the hive to perceive you as a greater threat (Hive Anger), increasing the number of chickens spawning and causing the Queen to appear earlier. 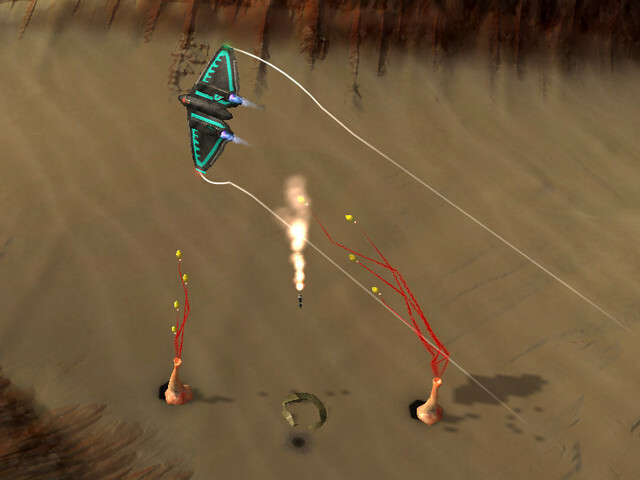 More defensive Tubes will also be spawned by burrows. It may be necessary to strike a balance between tech and anger. Note that the chicken tech time modifier cannot be less than -50% of the current gametime. The PAR goes up by (1/playercount) when a burrow is killed. The PAR goes down by 0.25 every wave. Positive values will increase the number of chickens and defensive tubes spawned (to drive back the enemy). Negative values will cause the chickens to increment their tech timer. Killing a burrow while the PAR is positive will make the queen appear sooner (proportional to the current value of the PAR). At sufficiently low PAR values, the chickens will use special "plots" to inflict damage on the enemy base. These range from spawning small digger chickens in the back of the enemy base, to deploying Chicken Spires, to spawning even the vaunted White Dragons. Generally, it's best to keep PAR at an neutral-ish value (slightly negative to slightly positive). The White Dragons, gatekeepers of the Hive, are deployed when the chickens are sufficiently threatened by their robot enemies. 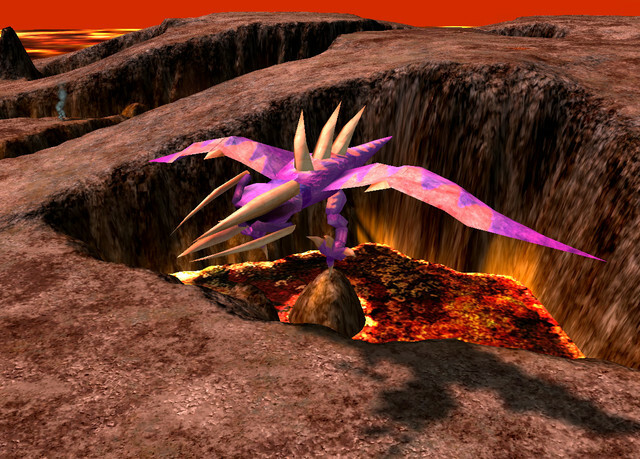 When the Hive Anger reaches a specific point (varies with difficulty level), these dragons will appear at random locations on the map and make a beeline for enemy forces. Dragons are extremely fearsome close up, but enough sustained fire will take them down. Don't take too long though; while they all spawn at different random locations on the map, things could turn out very badly for you if they link up. At sufficiently low PAR values, Dragons can also spawn next to a random player structure every few waves. The matriach of the Chickens, the queen only appears on the battlefield when all else fails. She is an extremely fearsome beast, with jaws of iron, devastating acid bile, and the ability to fire lethal "spores" at land and air targets alike. An extremely tough hide, multiple organ redundancy and rapid cellular regeneration enable her to survive seemingly impossible amounts of enemy fire. Like the Dragons, the Queen appears at a random place on the map, at a minimum distance from player units. 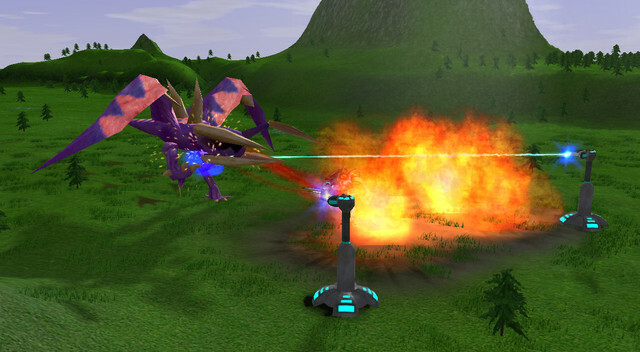 In addition to attacking the enemy, she also functions as multiple mobile burrows in one, spawning chickens during waves. The queen becomes progressively more resistant to damage with an increasing number of players. Additionally, as she takes damage, she gains new attacks including another spore spray, dropping Dodos, and even Basilisks or Tiamats (in addition to any chickens spawned during waves). Oh, did we forget to brief you? After a certain amount of time in the air, the Queen can land. She has a slightly different suite of attacks here, and can take quite a bit more punishment. She doesn't stay on the ground though, after a similar period of time she'll take to the sky again. The Chicken Panel gives you all relevant information on your current Chicken game. PvP mode (where chickens are added to a normal player vs. player game) works slightly differently. 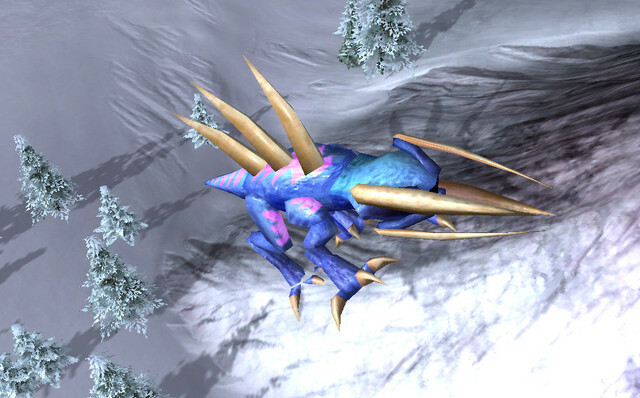 The queen does not attack at 100% Hive Anger; instead, regular waves of White Dragons will appear and pummel the players until all burrows on the map are removed. 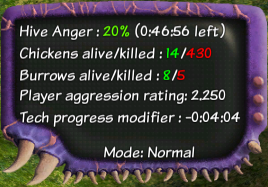 No reduction occurs in either chicken or burrow counts compared to regular mode, so this can be much harder than normal mode! This page was last modified on 24 April 2018, at 06:15.